2014 marks an important milestone for L’OCCITANE MALAYSIA as they are celebrating 10th beautiful years. 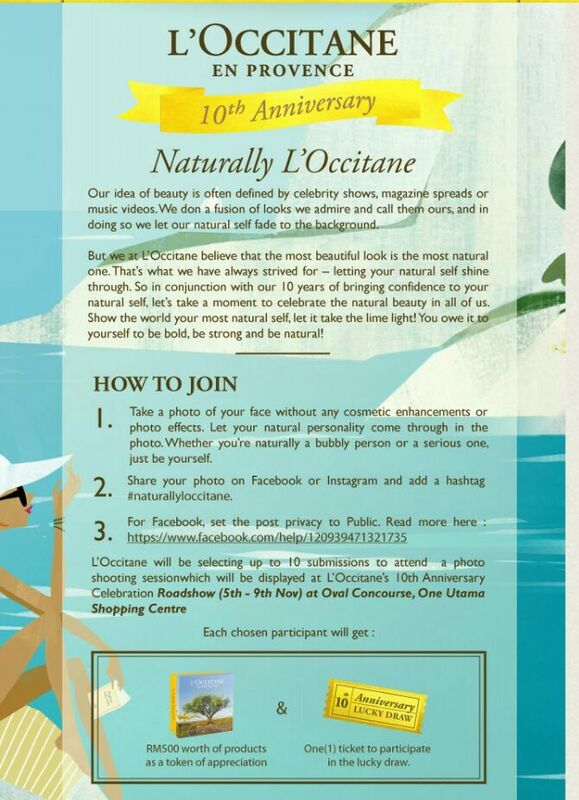 To make this events even more meaningful, there are many interesting activities lined-up and to kick-start this, you can join the #naturallyloccitane 10th anniversary photo contest which can grant you a chance to win L’OCCITANE Gift Sets & 1 Ticket to participate in the lucky draw. Guess what, the grand prize is a trip to Provence, France! No purchase needed. Just join the contest as per the rules above. It's as simple as that! Good luck. If you win the trip to Provence, do tag me on your photo!! !